It's easy to be cynical about the modern games industry. It was only over a decade ago that groups such as Nintendo, Konami and Capcom were at the peak of their creative output, releasing games that would become classics in their respective genres. In the past couple of years the true sides of these companies have come on display and it shows through their output of games that lack any sort of imagination, crushing people's hopes of continuations of their series (or in Capcom's case outright cancellation of them). Out of all of these companies SEGA seems to have come out better than anyone. They mostly get decried for their handling of Sonic and some rather silly decisions (cutting content of Yakuza 3, refusing to localise Yakuza Kenzan etc.) but in creating original IPs they still put out a rather surprising amount of great content even post-Dreamcast, Exhibit A: Rhythm Thief and the Emperor's Treasure. There are certain motifs that can be traced throughout SEGA's history that give their games a character that non-SEGA games lack, the most obvious one being bright blue skies to replicate the feeling of a summers day. Despite being a 2012 release Rhythm Thief is probably the most unapologetically SEGA game yet with colourful characters, a vibrant soundtrack, large presence of primary colours, and most importantly: lots and lots of blue skies. With all this in mind Rhythm Thief is very story-driven for a SEGA game. The main character Rapheal conceals the persona of Phantom R, an art thief who steals priceless works of art to discover the mystery of his missing father. For a plot that can be reduced to a fine bullet point it gives the sense of a sprawling adventure. Phantom R comes off through the game as one of the most elegant characters in video games since SEGA's very own NiGHTS, with an amount of sheen that is rarely found in modern video games. These traits are complemented by the gameplay. 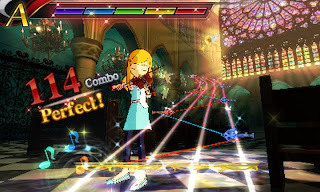 The nimble prowess of Phantom R can be proxied for the player in the game's core mechanics. These are broken down into minigames that each have a different method of control, to mixed results (tilt controls = BAD!). It could be summed up as Rhythm Tengoku with a story but this does the game a disservice. It helps that Rhythm Thief is up there with Super Mario 3D Land for having the best 3D effects on the system and a vinbrance that other games lack. My biggest criticism is the glue holding the mini-games together. 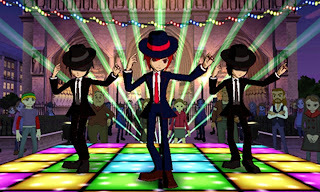 The game has a Layton-esque map system to it that while providing complementary dialogue to give the game more of a sense of whimsy, it comes of as unnecessary, especially when the game gives you a puzzle than tells you where to go to solve it (I would have preferred a more Gitaroo Man approach of story telling). There's another problem with the music itself. While it isn't bad by any sense of the word, most of it is rather forgetful which is rather important for a game that is based around music. These problems sound major but you'll be so charmed by everything else that it doesn't seem important, and it isn't. It's a love letter to SEGA from SEGA and does it need to be anything else?